The removable phone bracket is retractable and can fit mobile phones with 56-85mm wide screens. Made from reinforced plastic with rubber padded inner to keep your phone safe and secure during use. Device can be mounted vertically or horizontally. Weighing less than 1kg, it is compact yet strong and ideal for travel. Quick release leg locks enable the tripod to be extendable from the folded height of 53cm (21″) to 140cm (55″) when the gearless extending centre pole is at its maximum. The iGadgitz premium smartphone tripod mount is easy to install and convert your smartphone into a digital camera. The retractable phone bracket and can fit mobile phones with 56-85mm wide screens. 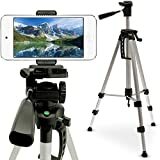 This entry was posted in Discount Photography and tagged Adapter, Apple, Bracket, Complete, Extendable, Holder, iGadgitz, iPod, Mount, Portable, Premium, Sections, Smartphone, Touch, Tripod by Ball Photo. Bookmark the permalink.